This guide assumes you have a Linksys BEFSR41 router. It will be fairly similar if you have another Linksys router like the 'wireless' or 'firewall' (BEFSX41) version but I'm not sure because I don't have these. 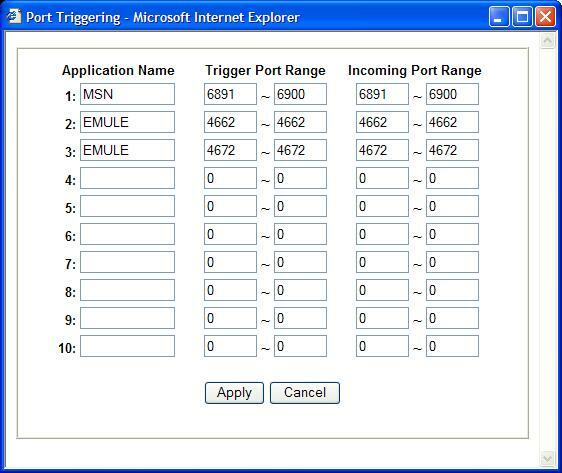 The aim of the guide is to show you how to setup your Linksys router so that you can use eMule. There are two ways to do this, either as below using UPnP, or by using a browser. These instructions are long and drawn out on purpose, hopefully so you don't get stuck! Realistically the whole thing is really very easy once you get the hang of it, so please don't be too intimidated by how long these instructions are. There are some serious security issues with Universal Plug and Play. You should read about them here. Thanks to Monk for letting me know about this. alternate instructions for setting up port forwarding without UPnP. Or, if you decide that you are perfectly secure then continue below. The first step is to make sure you have a fairly recent firmware version for your router. Firmware is like the internal software inside the router. You can upgrade to the latest version by visiting the Linksys download page. Select your router from the drop down list, select the firmware link, save the file and follow the instructions. They make it fairly easy and straightforward to do, and it is quick. Compare what you see to my picture, if you have the entry that says Internet Gateway enabled, you already have UPnP installed and this whole process will be easier. Windows XP should have already set all this up if you bought your router and it already had firmware version 1.42 (?) or later installed. If you do anyway then skip ahead to step number 4 below. 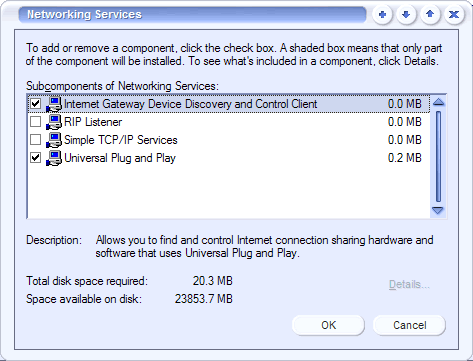 In the Windows Components Wizard, click Networking Services, click Details, and then select the 'Universal Plug and Play' check box. You should also see 'Internet Gateway Device Discovery and Control Client' listed, put a tick in the check box for this also - as I've done below. 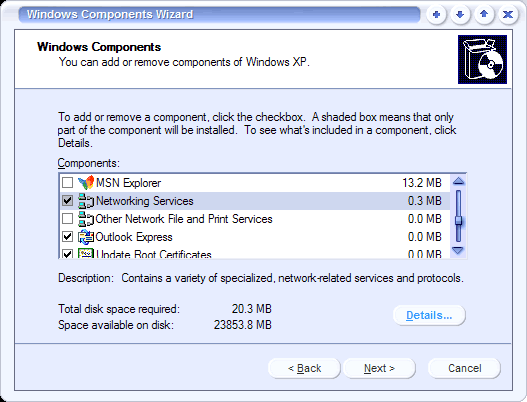 Click OK, and then click Next in the Windows Components Wizard. You may need to provide your Windows XP installation CD. 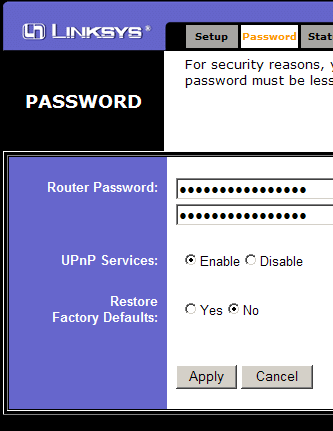 Now check back to step 2 above to make sure you have the UPnP working right. It seems to take a while for the internet gateway entry to appear so be patient, wait a couple of minutes perhaps and check again if it isn't showing when you first look, refreshing the window often makes it miraculously appear. ...in this example it is 192.168.1.100, make a mental note of whatever yours happens to be. 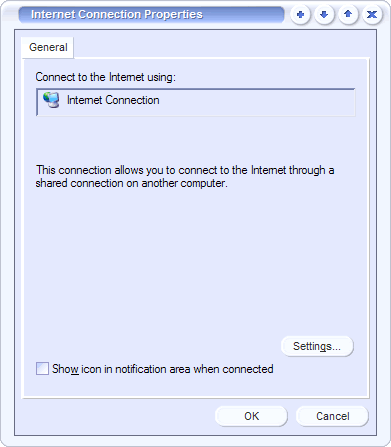 Back on the main section of the page, right click on 'Internet Connection' and then select 'Properties' from the menu that appears. Click 'Ok' to save the settings you made and exit. That's pretty much all there is to it! You've told your router to forward incoming traffic to ports 4662 and 4672 on your computer. Run emule and everything should now work. There's another way of doing all this. Open up your web browser and type in the address: http://192.168.1.1 to access your router status pages. Enter your password, the username is an empty field on my machine and it doesn't seem to matter... you HAVE changed the default password right? If not then for your own sake read your linksys manual and do this now! Look in the Client Hostname column, find your computer name and memorize the last three numbers of the IP address to the right of it. 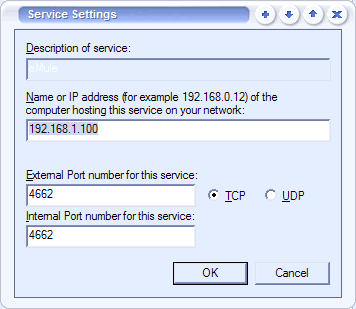 In this example the client hostname is 'Christopher', and the last three numbers of the IP address are 100. Once you've got those three numbers memorized then close the window. At the bottom click on 'Apply' to save the settings you just typed in. Now your router is setup to forward incoming traffic to ports 4662, and 4672 on your computer. Close out the browser window, and run eMule, it should now work! 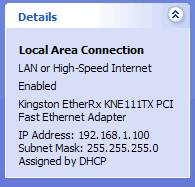 Open up your internet browser and type the IP Address of your router (default: 192.168.1.1). Enter in your password (default: admin - change it!). Click 'Advanced'. Click 'Forwarding'. In the Forwarding screen you will find the button Port Triggering. Click it and enter the configuration shown below. You can ignore the msn entry when configuring eMule. 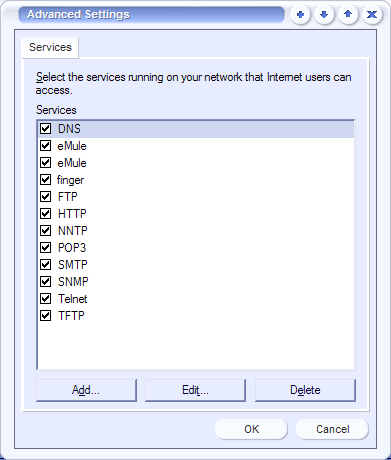 Press 'Apply'.This should now allow your router to forward eMule packets to your machine without the need for specific IP Addresses allowing for DHCP or multiple machines using eMule.